I was fortunate enough to travel to Landschaftspark Duisburg-Nord this summer, among other places, with a grant from the grad studies department at RISD. My main motivation for visiting the infamous landscape post-industrial park was to understand the acceptance and conscious conservation of the ugly, and how minimal safety precautions were inserted to the remaining machinery. 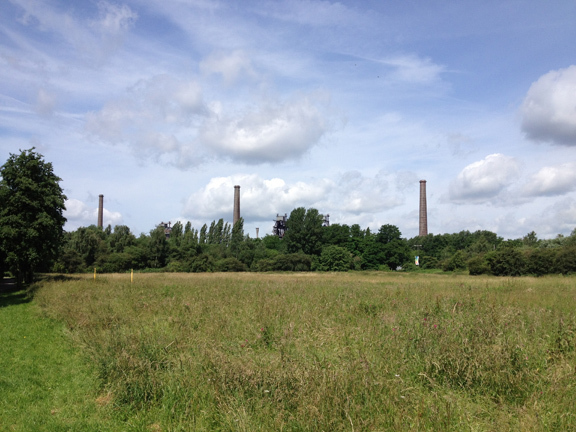 Are the derelict steel and coke production structures modern ruins? While crumbling feats of an empire's architecture and engineering are marveled and protected, the iconic structures of man's leap into the mechanized industry stand like frozen monsters in the landscape. Now safe to approach, to touch, but the massive static parts allow us to imagine unbearable sound of massive machine, of heat and flame, and the haze of smoke that once emerged from these now silent beasts. I was staying in Amsterdam. I took the commuter train to Duisburg, a 2 hour ride. 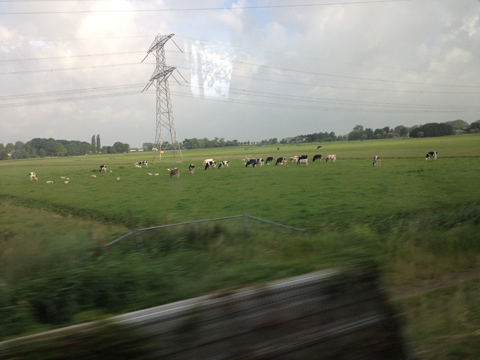 The flatness of the surrounding cowfields slowly morph into a system of suburban / ex-urban industry, passing through the Dutch cities of Utrecht and Arnhem along the way, accompanied by the small residential neighborhoods that once housed the employees of the surrounding factories. The town was not dissimilar to my own blue-collar town of Chillicothe Ohio. Sporadic development deleting chunks out of the otherwise idyllic country landscape. Towers of smoke plumes a fixture in the western horizon. A bus led me to one of the further most entry points from the epicenter, which was ideal. All I could make out in the distance was the towering smoke stacks. The rest concealed by trees, a mix of meadow and wooded path appeared to lead the way. It was late June, and the weather pleasant, so I was happy for this derivation.. The marvel of Duisburg Nord is the restraint Latz Partners showed in over-designing. Volunteer plantings dominate as growing material, existing structures and catwalks lead into internal surprises of sound and light installations, bowels of concrete bunkers became a series of gardens, fragmented walls re-purposed for recreational climbing. Duisburg Nord was given back to the landscape. Not to be consumed and taken over by it but as a supplemental typology that embeds into the existing. It is not apologetic, to its contentious past, which allows for a homeostasis to be attempted. The man-made platforms give once unseen vistas, channels and wind -powered pumps give access to moving water. Being the only visitor in site, I could sense the park is now functioning as a new nature. But consider that these ‘remains’ that exist today quite often became so in our lifetime. Change at large scale can occur within months creating rapid remains. I like to imagine the possibility of landscape architects being engaged to design the future-future uses of industry. Knowing that resources in a given area would eventually be depleted and abandoned. The industrial complex would be designed for sustainable excavation [as possible] and processing of material, limiting long-term ecological devastation. The machinery, buildings, and grounds are considered for spatial consequence, so as it one day is transformed into a public space, the transition is seamless. Perhaps taking note from the great Louis Kahn, and starting with the idea of ruin, and removing any indicators of time and scale, creating timelessness. How would this occur? What motivation would energy and resource big business have for taking these extraneous measures for the common good? I can imagine that post-industry design and planning becomes a requirement for all industry, where the question is asked, what are you doing for your inevitable irrelevance?